Risotto is one of my favorite things. And not just one of my favorite foods but one of my favorite things...ever...out of all things. I've been in a funk for the last couple days, brought on in large part by an email from Bug's teacher, letting us know about our daughter's defiant behavior on a field trip. I take this sort of thing so personally and, even if it's not rational, I feel like I have failed in some way. Ugh. So it's times like this that I make risotto. It's a solid 30 minutes of standing in my kitchen and calmly stirring, stirring, stirring. It's meditative. It's surprisingly easy to make. It's comforting. Rather than running all over the kitchen, I get to stand in one place. I can even make it with a glass of wine firmly in hand. I have had the recipe for this risotto from Bon Appétit since 2007 (here's the original). Inexplicably, I let it sit and never made it. I've made some changes to the recipe I linked to - first, I didn't add an actual shaved truffle. I mean, seriously, who does that? Especially a family of three during a weekday. And in this economy. Additionally, I used vegetable stock, like the recipe says, but it gave the risotto an odd orange color; I'll use chicken stock next time. Lastly, the recipe said to roast the mushrooms and onion for 45 minutes, but that was waaaay too long in my oven - they were blackened to a crisp and I had to pick out only the good ones. So beware the cooking time. NOTE ON KID-FRIENDLINESS: I made this kid-friendly in the last step. Before adding the leeks and mushrooms to the risotto, I transferred the plain risotto to a bowl for Bug and garnished heavily with Parmesan. The heavy use of Parmesan helps mask the pieces of chopped onion in the risotto. Eat, drink, and stir your way out of a funk. I haven't got kids of my own, but my sister and I are practically siamese twins and I feel that her kids are mine:-D So I know how you must feel. We've been there. I love teachers - since I am one! But I must admit I think they sometimes make a big crisis out of a small incident. Imagine if our boss had to call our parents everytime we had a bad day at work. Hope the risotto has cheered you up. Looks delicious. Carina, thanks SO MUCH for the words of encouragement and helping to put things in perspective. The very idea of Adam's boss calling me every time he has an "off" day is hilarious. It was equally sad when she came home today and said, "My goal today was to go completely unnoticed. I did everything the teacher told me and no one noticed me. It was a good day." * head desk* So those are our options? Being talked to about a defiant child lacking focus...or having a ghost of a child who tries to fly under the radar? It's all so demoralizing. Ugh. I don't want to talk about it anymore. 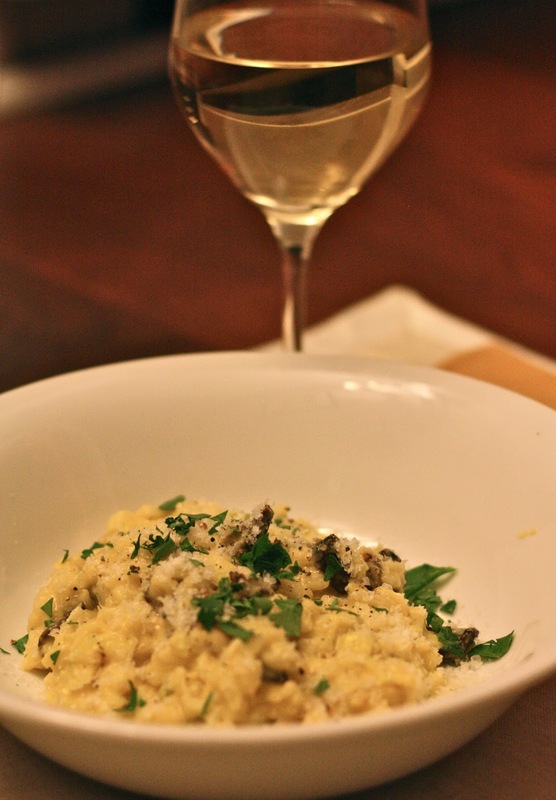 Thank the gods above for risotto and lots and lots of wine. And blogging friends!